Yoga poses engage the legs for strength and balance. Yoga poses stretch and strengthen muscles, helping you to stay lean and toned. Asanas that engage the legs contribute to better balance, greater energy, improved posture and less stress. You can use specific postures to build stronger bones, protect joints and ligaments, ease tight muscles and even cure chronic pain. 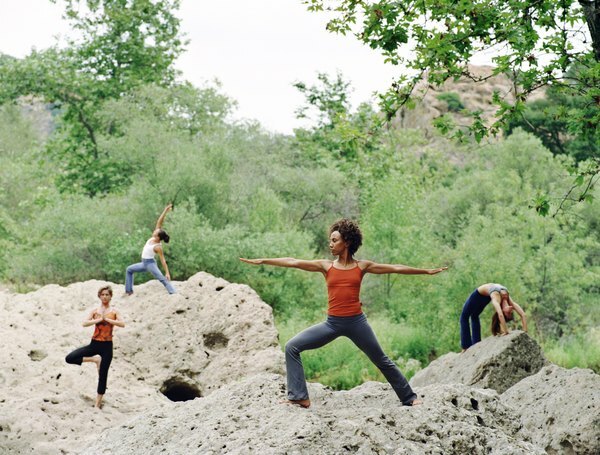 Yoga poses for your legs reinvigorate and revitalize body and soul. Viparita Karani, Legs-Up-the-Wall pose, relaxes and energizes tired legs. With a folded blanket or bolster for support under your hips, lie on the floor with your extended legs and flexed feet resting against a wall. "Yoga Journal" says Viparita Karani will soothe cramped or fatigued legs and give your calves, thighs and neck a gentle stretch as it eases your mind. (See Reference 6) Traditional yoga literature credits the pose with healing everything from headache to high blood pressure to varicose veins and anxiety. Other leg-focused asanas, including Utthita Hasta Padangustasana or Extended Hand-To-Big-Toe pose, strengthen, stabilize and ground the legs. (See Reference 5) This pose improves balance while it stretches the back of your leg and strengthens legs and ankles. Setu Bandha Sarvangasana, Bridge pose, restores vitality to overworked legs as it relieves stress and mild depression. Sciatica is painful pressure on the sciatic nerve that runs from the spine, through the buttocks, down the back of your leg to your foot. You might notice the pain while bending frontward, running, sitting or driving. The pain may prevent normal ankle flexion or affect your Achilles tendons or knees. One common cause of sciatica is a tight piriformis muscle that presses on the sciatic nerve. (See Reference 4)The piriformis is a smal but strong hip flexor, one of the external rotators. Dancers and runners often have tight piriformis muscles because they rely on the rotators for stabilization. (See Reference 3) Stretching the piriformis will ease pressure on the sciatic nerve and counter tightness in the external rotators. The Himalayan Institute recommends Ardha Matsyendrasana, a Half-Spinal Twist, to target the piriformis. (See Reference 1) Modified Gomukhasana, Cow’s Face pose, works all the rotators and Raja Kapotasana, King Pigeon pose, is an advanced piriformis stretch. Hamstring health occupies the middle ground between tight and too stretched. Overstretched hamstrings can destabilize your knees and cause pain while sitting. But tight hamstrings are by far the most common problem, as they will flatten out the natural curve in your lower back, putting you at risk for a rounded upper spine and back injuries. (See Reference 7) Tight hamstrings inhibit range of motion in daily activities; that inflexibility makes you look, feel and act old. Yoga poses can help you to achieve healthy hamstrings but an aggressive approach will just lead to more problems. Stretch tight hamstrings slowly to prevent injury. Begin with poses like Supta Padangusthasana, or Reclining Big Toe pose, using a yoga band for a gentle stretch. Performing Utthita Hasta Padangustasana with the raised leg supported on a padded chair allows you to stay in the stretch. (See Reference 8) Add Supta Baddha Konasana, Supine Bound Angle pose, to release the tight inner thighs that limit hamstring flexibility.